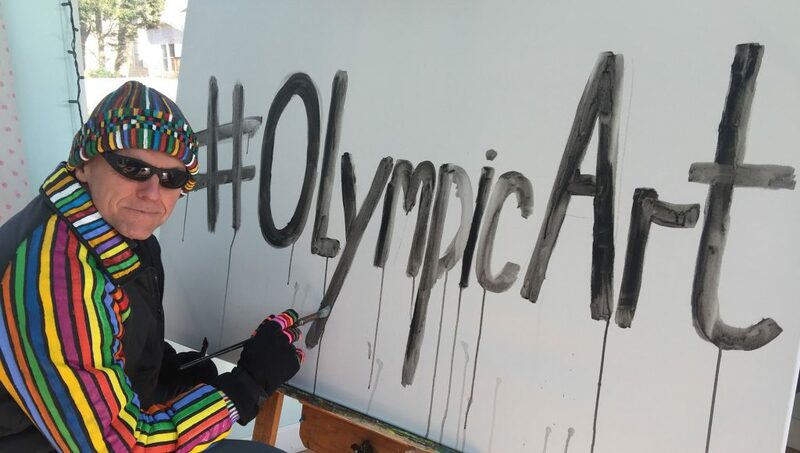 United States Sports Academy 2003 Sport Artist of the Year Roald Bradstock of Atlanta, a two-time Olympian, paints a mural as part of the inaugural “Olympic Art Project” at the Pyeongchang 2018 Winter Olympic Games in South Korea in February. Photo courtesy of Roald Bradstock. Bradstock was one of four former Olympians who brought the Olympic values to life through art by coming together with athletes for the project. It was the first time in the history of the Olympic Winter Games that Olympians who are also artists were invited to the Games to participate in the art project. 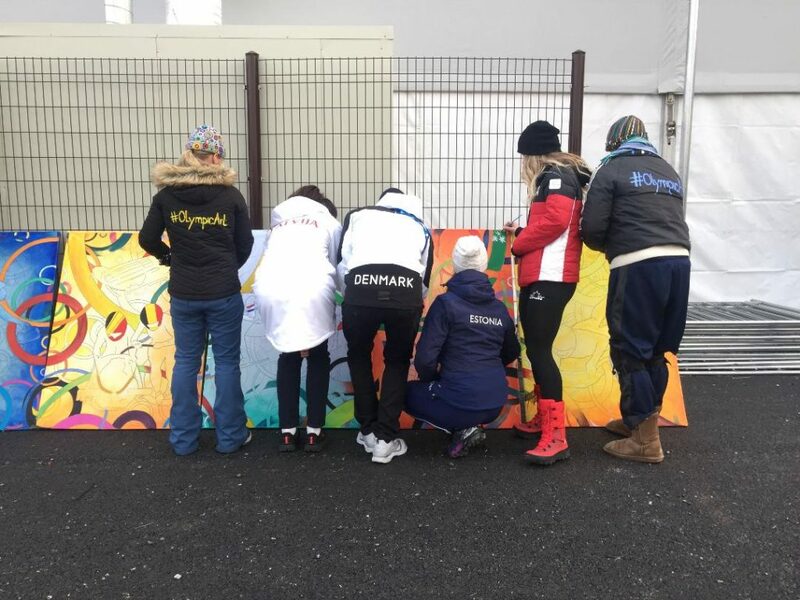 Over 17 days, more than 100 Olympians took part in the project in which Bradstock and other artists and athletes completed 15 paintings inspired by different Winter Olympic events. The works were shown in the Olympic Village in Gangneung. In fact, medals were given in art and literature from the London Olympics in 1908 to the London Olympics in 1948. In 2003, Bradstock was honored as Sport Artist of the Year, painter, by the United States Sports Academy for his unique art style that promotes athletics and for his efforts to unify the Olympics and Paralympics. “I always struggled to decide if I was an artist or an athlete, thinking they were these separate parts of my life,” Bradstock said. “But when I was given the Sport Artist of the Year award, I learned from the Academy about Coubertin’s ideals and about the International Olympic Committee (IOC) and its art contest. I was an ‘Olympic artist’ because of the Academy and am now recognized internationally as a serious sport artist because of the Academy. “Both sport and art are universal languages. The Academy taught me that art and sport both reach across generations and cultures. If you think about it, the Olympics – the world’s greatest athletic event – begins and ends with a big theater production with art, music, dancing and drama. Sports like gymnastics, synchronized swimming, figure skating, and even basketball are like these choreographed pieces of art. Even the medal ceremonies – with their dramatic music, emotional athletes, stages and artistic medals – are artistic productions. 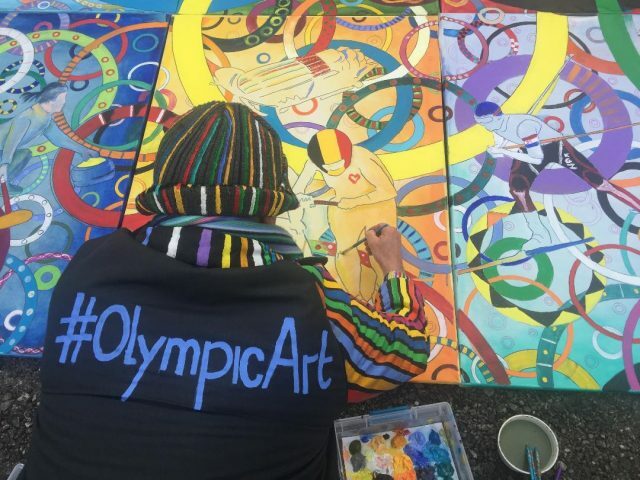 United States Sports Academy 2003 Sport Artist of the Year Roald Bradstock of Atlanta, a two-time Olympian, took part in the inaugural “Olympic Art Project” at the Pyeongchang 2018 Winter Olympic Games in South Korea in February. Photo by Audrey Bradstock via Olympic.org. In 2016, Bradstock was appointed executive director of the Art of the Olympians (AOTO), which funds programs that meet and foster its mission of developing art, education, sport and cultural outreach programs to inspire individuals – particularly youth and their communities – to uphold and promote excellence and the highest ethics of humanity. Bradstock, nicknamed the “Olympic Picasso” by the British Broadcasting Company (BBC) because of his ideas of connecting sport and art, is a professional artist with a distinguished career of international competition in javelin. He represented Great Britain at the 1984 and 1988 Olympic Games. Born in 1962 in Hertford Heath, England, Bradstock began drawing and painting as a child. Also pursuing his passion for sports, Bradstock ranked number two in the World Junior Division for the javelin throw in 1981. This victory gained him an athletic scholarship to Southern Methodist University in Dallas, Texas. He earned All-American awards in 1982, 1983, and 1984, and earned his Bachelor of Fine Arts degree with honors. Famous for his sense of humor to increase awareness of athletics and especially of the Olympics, Bradstock has worn colorful outfits and has engaged in demonstrations of throwing various objects other than the javelin, such as golf balls, iPods, phones, and even fish – at the annual Flora-Bama Mullet Toss on the Florida-Alabama coastal border. Athletes from various nations take part in the inaugural “Olympic Art Project” at the Pyeongchang 2018 Winter Olympic Games in South Korea in February. Photo courtesy of Roald Bradstock. The Sport Artist of the Year Award is part of the United States Sports Academy’s Awards of Sport program, which each year serves as “A Tribute to the Artist and the Athlete.” The Academy presents the awards to pay tribute to those who have made significant contributions to sport, in categories as diverse as the artist and the athlete in several different arenas of sport.